FOCUS ON FIRST PRINCIPLES +Reduce all strategies, challenges, and opportunities to their most fundamental levels. Data driven. Agile. Creative. Long term focus. Learn from all mistakes. Iterate and improve. Repeat. Progress. 'Simplicity is the ultimate sophistication'. CREATE • CONNECT • MONETIZE +Create amazing products. 'The Best Wall Graphics in the World'. Faster. Bigger. Better. More. Delight all customers. Worldwide. Liberate and monetize digital content libraries. 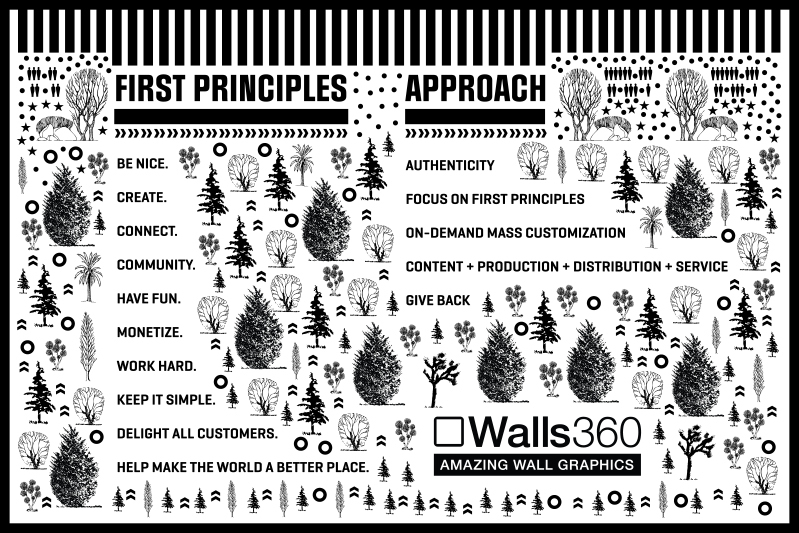 Bring 'virtual content' to empty walls in the 'real world'. Create a new medium for creative expression. Focus on long term growth. Make money. Expand. Give Back. GIVE BACK +Community and service. Support educators and arts education. Create eco-superior products. Support 'creator culture' worldwide. Encourage, develop, and support entrepreneurs. Connect creators. 'Find the Others'. Connect communities. Hire artists. Create jobs. Made in USA! Of all the wall graphics I’ve tried, Walls360‘s are by far the best!